My pops is a hard guy to shop for. The one thing that never disappoints him is shirts with pockets. Sounds simple, but the man has spent his life in pursuit of quality shirts (the right cotton weight, good stitching in the crew neck, appropriate upper arm coverage by way of long enough sleeves) and while there are many makers of fine tees, finding all of that plus pockets is a bit like a really anticlimactic treasure hunt for my family. So for his birthday this year I decided to ditch the shirts and went for something I know he’ll enjoy: dogs. My dad’s two dogs are like children and he dotes on them a lot like Mumbles and I do with Baxter. I found this awesome book Maggie on Things via A Cup of Jo. 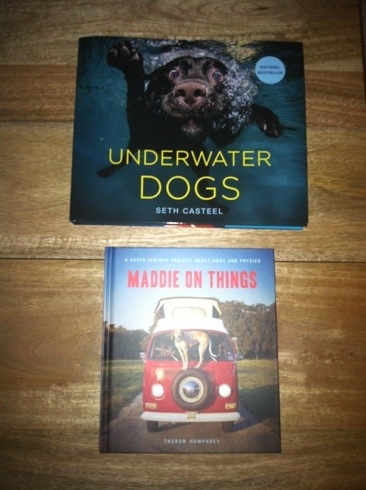 And I’d heard of the Underwater Dogs photos but I was delighted to find they’d been made into a beautiful coffee table book. It’s so goofy and fun and the whole story about how the author found fame and his calling — very cool. I think it’s awesome that both books were never intended to be books at all – they were just a collection of photos on a blog or on a website. How reaffirming it must be that the thing these people are most passionate about or find simple pleasures in has found a place in the hearts of so many others. Just captivating! and wanted to say that I’ve truly enjoyed surfing around your blog posts. After all I’ll be subscribing to your rss feed and I am hoping you write again soon!